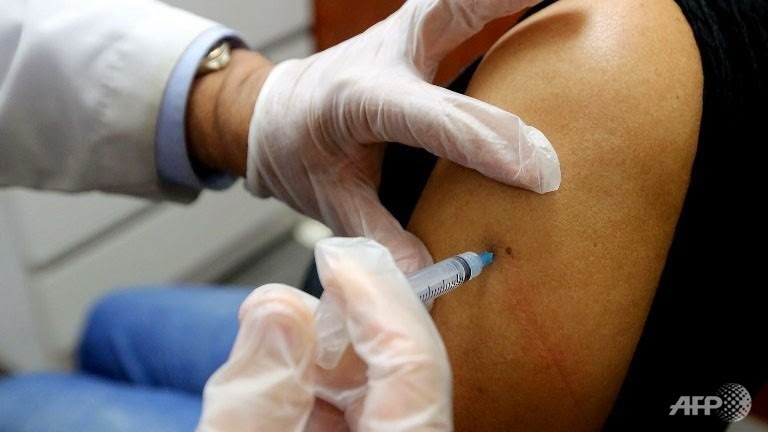 The world's first dengue vaccine will hit the shelves next year, following the completion of trials that found it 56 per cent effective. Produced by French pharmaceutical giant Sanofi, it offers varying degrees of protection against each of the four types of dengue virus. For Den-3 and Den-4, it offers 75 per cent protection; for Den-1, it is 50 per cent; and for Den-2, it is just 35 per cent. Unfortunately for Singapore, the latter two types are the ones most commonly found here. "It is promising, but not perfect," said infectious diseases expert Annelies Wilder-Smith of the Lee Kong Chian School of Medicine. Dengue cases have continued to rise over the years and there is currently nothing else to fight the mosquito-borne disease, said Professor Wilder-Smith, who is also an infectious diseases specialist at Tan Tock Seng Hospital. A record 891 cases were reported in Singapore last week and since Sunday, another 630 people have fallen ill. So far this year, 10,184 people have become sick and one has died. Of the 110 active dengue clusters, the biggest is in Choa Chu Kang with 160 people infected in just the past fortnight. The results of the clinical trial of Sanofi's dengue vaccine on more than 10,000 children in Indonesia, Malaysia, the Philippines, Thailand and Vietnam were published in medical journal The Lancet yesterday. Children aged two to 14 were given three jabs over one year and were followed up for another year. Prof Wilder-Smith was not sure how relevant the study is to Singapore, as most dengue victims here are adults. But it might actually work better in grown-ups because the vaccine was found to have a greater effect on children who had been infected previously, she said. In Singapore, about 45 per cent of adults have had a dengue infection by the age of 45, though many might not be aware of it as their symptoms could have been mild. In the trials, older children received better protection from the vaccine. Prof Wilder-Smith said in a commentary in the same edition of The Lancet: "This vaccine boosts and broadens pre-existing immunity rather than raising protective immunity. Perhaps the most interesting finding of this trial was the efficacy after at least one dose was almost as high as that after three doses." A plus point for the vaccine, she said, is that it reduced the serious form of dengue by up to 80 per cent. But whether it is cost-effective to vaccinate the population will depend on the pricing, which has yet to be announced. The health ministry said it will study the report, adding: "One of the challenges in dengue vaccine development has been ensuring that there is good protection against all four serotypes." A second clinical trial in Latin America involving more than 20,000 nine to 16-year-olds ends later this year.